(Not so) Muliti-Coloured Swap Shop | attic. Just to give you a heads up on what’s going on at the moment. We are making some exciting changes to our shops in Hampton Hill. We’ve decided to ‘swap shops’. 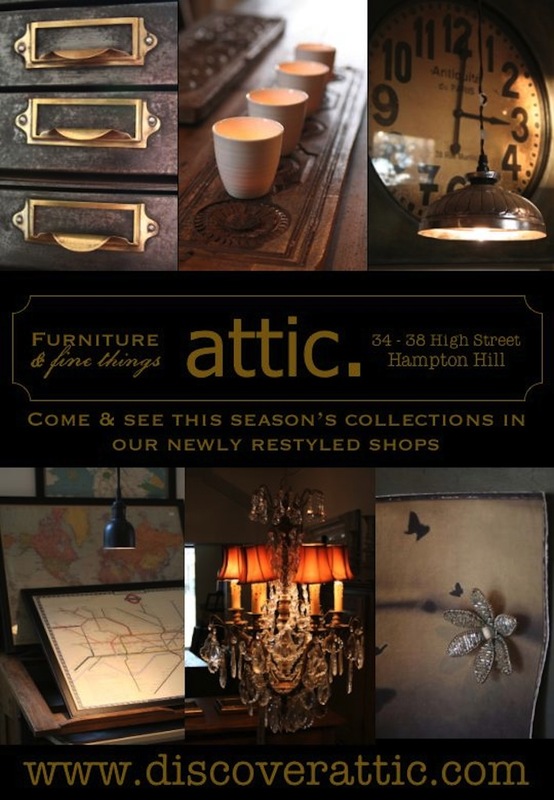 This Sunday (22nd Oct) – Tuesday, the furniture shop (38 High Street) will be moved to the gifts & accessories shop (34-36 High Street) and the gifts & accessories shop will then reside in the furniture shop premises. Due to increasing trade in the gifts & accessories side of our business, there is a strong need for more space. There will be more room to create better displays/visuals and we can merchandise the stock in such a way that products will have their own space. It will hopefully be a far more relaxed environment as well, so we can provide a better shopping experience with more room to offer the customer, services such as gift wrapping etc. Although the open space of the current furniture shop is fantastic, we have always felt that the original site (34-36) worked better. The layout of the original shop is far better suited to furniture. It is made up of individual, smaller rooms, which will enable us to create more inspiring rooms and interiors collections. Hopefully it will be easier for customers to imagine the furniture in their own homes. We’ll be able to group together home office, living and kitchen/dining in a far more coherent way, giving each area more clarity. So that’s the plan. As I said we’ll be closed this Sunday (as usual), but we’ll also be closed this Monday, Tuesday and maybe Wednesday. Re-opening on Thursday 27th October. Check back to this blog on Tuesday, for updates. We’ll let you know the definite re-opening day. This entry was posted in information by attic. Furniture & Fine Things. Bookmark the permalink.